The typical construction project lifecycle can range anywhere from weeks, to months, and in some cases, years. Such is the case at the University of Illinois Hospital of Health & Sciences. Thousands of patients receive yearly medical attention in the Illinois Medical District and an active Emergency Room provides Chicagoland with around the clock care. The secret to a happy hospital patient can be attributed to one thing, comfort. Comfort brought by clean, fresh, circulated air. In January of 2016 the replacement project of the hospital’s Air Handling Units opened to mechanical contractors. An Air Handling Unit is a device used to regulate and circulate air as a part of a heating, ventilating, and air conditioning system. AHUs can be considered the lungs of a building’s anatomy. Mechanical Inc Estimating Department Manager, Jesse Arndt, and HVAC Estimator, Kyle Warner, collaborated with La Grange Crane’s estimating department at bid phase to properly scope the project’s crane needs ahead of bid day. Properly budgeting at bid phase and utilizing La Grange Crane’s WBE certification helped Mechanical Inc bring home the prestigious contract award. Fast forward many months, Mech Inc Project Manager, Jay Shaw, called on La Grange Crane for the first of many lifts at UIC. From Autumn 2016 through Summer 2017, 550 Ton Crane Operator, Curt Read, and 350 Ton Crane Operator, Tim Cahill, hoisted thousands of pounds of equipment to the hospital’s highest level. 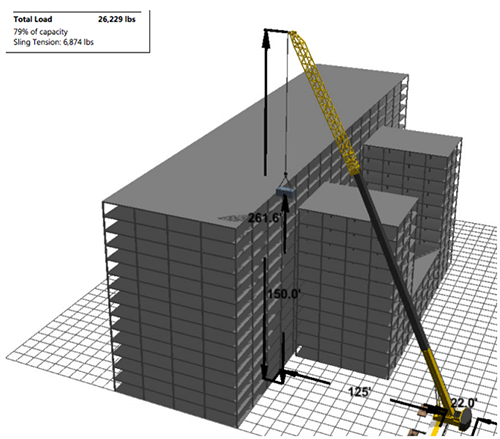 The heaviest Air Handler totaled 26,229 lbs and was smoothly elevated through a side wall opening 150’ off ground level. 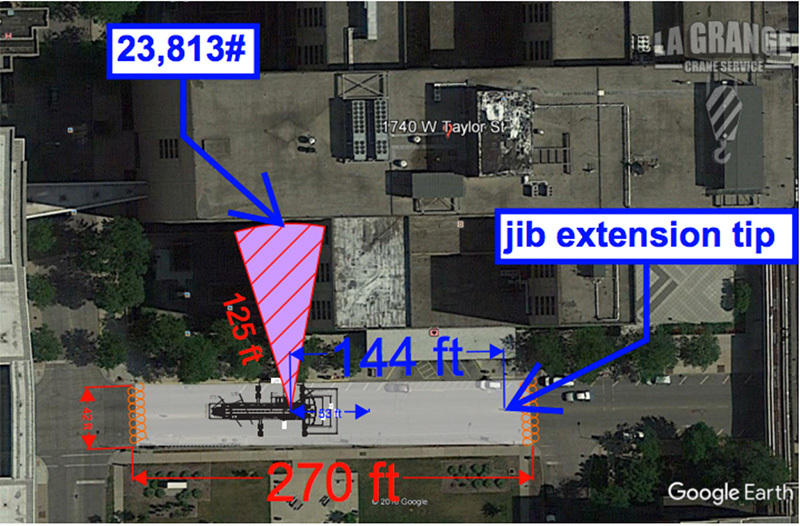 Shown below is La Grange Crane’s site plan noting the 550 Ton Crane’s load weight, pick radius, and setup space. A thorough project plan and crane layout are a part of what La Grange Crane brings to the table on a high caliber job requiring collaboration and communication of the city, clients, contractors, and their communities. The crane work on this project is now complete while other trades continue to put finishing touches on a portion of UIC hospital that is seldom seen. When it is all said and done, very few of the hospital’s staff, patients, and visitors will ever know how the building’s vital organs were replaced over a 12 month period.